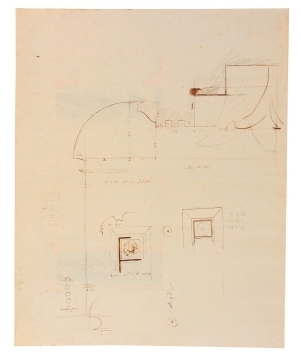 Drawings 16 and 17, as in drawing 15, show the use of paving brick, hollow cones and stone in the construction of the Rotunda. Just above the voussoired heads of the lunettes, a ring of stones encircled the dome, bound together by a square-sectioned iron tie-rod embedded within the stones. Six courses of jointed stone steps rose to form the sprining point of the dome. The stones were secured together by lead running into a cavity formed by opposing vee-grooves. As the inscription in drawing 16 reads, alternating layers of 4 courses of cones and 3 courses of brick work were built up from the stone springing point to the oculus of the dome (see drawing 15). 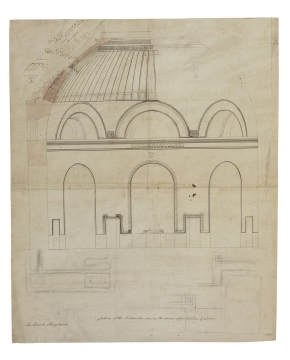 The external surface of the dome, from the lantern to the lunettes, was covered with cement in 1795, due in part to a suggestion from George Dance and the poor results of the Bank Stock Office's roof. The cement casing was reported to have failed in 1827, at which point the dome was covered with nine-pound lead. It was also ordered that a lantern be added to the centre, amounting in total to a cost of £1350. John Bayley (d.1812) was a plasterer and principal tradesman employed at the Bank of England. J. 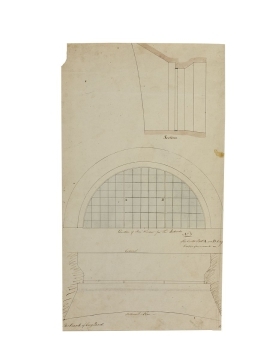 Lever, Catalogue of the drawings of George Dance the Younger (1741-1825) and of George Dance the Elder (1695-1768) from the collection of Sir John Soane’s Museum, 2003, p. 356, cat. 101; H. Rooksby Steele and F.R. Yerbury, The Old Bank of England, London, 1930, pp.17-19.